Q1: Include orphans in OBC list? Based on the Polity Current-Affairs during Aug-Sept. 2016. Answer following questions in 200 words each. 1) Examine the merits of including orphans within central list of OBCs – as suggested by the NCBC? ‘अनाथ व्यक्तिओं को केंद्र सरकार की ओ.बी.सी. लिस्ट में शामिल करने के राष्ट्रीय पिछड़ा वर्ग आयोग के सुजाव का योग्यता परिक्षण कीजिए. Why this question: OBC demands by Patel, Jat, seems rather too loud a new item for UPSC to ask! 2) Explain “Doctrine of severability” under Article 13. Discuss how Supreme Court has utilized it the judgment on the validity of Section 2(q) of Domestic violence act. संविधान के अनुच्छेद १३ के अंतर्गत “पृथक्करणीयता के सिध्धांत” का मतलब समजाइए. सुप्रीम कोर्टने घरेलू हिंसा संरक्षण कानून की धारा २(क्यू) के औचित्य के फैसलेमें इस सिद्धांत कैसे उपयोग किया है?- विवेचना कीजिए. 3) Discuss the significance of Section 52(1)(i) of Copyright act, 1957 in providing educated workforce to India increasing the spread of knowledge. Discuss how it has been utilized in the 2016 Supreme court judgement of Rameshwari Photocopy case? भारत में शिक्षित कार्यबल उपलब्ध कराने एवं ज्ञान के प्रसार को बढ़ावा देने में कॉपीराइट एक्ट की धारा ५१(१)(इ) के महत्व की चर्चा कीजिए. रामेश्वरी फोटोकोपी केस में सुप्रीम कोर्ट के २०१६ के फैसलेमें इसका कैसे उपयोग हुआ है?- चर्चा कीजिए. Why this question: UPSC GSM-3 (2013) asked similar question on Section 3(D) of Patent Law & Glivec case. 4) Discuss the Representation of People Act (RPA) -provisions related to participation of prisoners in election and legislative process. Do you think it should be amended? Justify your stand. जनप्रतिनिधित्व कानून के अंर्तगत कैदीओ को चुनाव प्रकिया एवं विधायी प्रक्रियामें शामिल करने संबंधित प्रावधानों की चर्चा करे. क्या आपको लगता है इनमें सुधार की आवश्यकता है? अपने रुख का औचित्य सिध्द कीजिए. Why this question: Though RPA is in syllabus, so far no direct question in Mains since 2013 + some Current Affairs developments in September 2016. Mains Answer writing is not a rocket science because even if it was- there is not enough time either at present or in the actual exam hall to apply it! But since these are descriptive papers so the standard formula of liberal arts /humanities applies i.e. body: feature, pro, con, reform etc. Separate paragraphs / headings for each sub-questions. conclusion: though nature of UPSC questions is such that there is not sufficient time / opportunity to think of proper conclusion. so, in real exam, the answers mostly show start and end at “body” only. Examine the merits of including orphans within central list of OBCs – as suggested by the NCBC? Is it worth pursuing? has anyone done / recommended this in past? Is it substantial enough to get passed in parliament / win in court? Since we don’t know what angle(s) the examiner expected- so have to cover all three. Only talking about ‘pro/con’ will be shallow. Orphans already included in some State OBC list (TN, Rajasthan and Telangana)- because not having parents puts them at disadvantage. OBC status ensures them equal opportunity in education, public-sector employment; and handholding through scholarship, grant, finance, subsidies. Less Emotional distress and Juvenile delinquency. 27% pie gets smaller for other castes- so political opposition. NCBC recommended OBC status for Transgenders, and SC also ordered the same. Yet, Transgender bill in lok Sabha- no mention of reservation. Same may happen for orphans. NCBC’s resolution is a welcome-step in that direction, but, political consensus will be required. Article 13 of the Constitution mandates that the state shall not make any law which takes away fundamental rights. Otherwise, Judiciary can void the offending law -fully or partly -according to the extent of damage to fundamental rights. “Doctrine of severability” – means judiciary has the power to ‘divide/separate’ the unconstitutional parts of a law, while keeping the remaining part of that law as valid. Benefit? if entire law deleted than legislature will have to go through whole exercise of ‘bill-passing’. So, if only the unconstitutional part is removed- it saves time of Parliament / Vidhan Sabha. Domestic Violence Act 2005: Section 2/q: Complain can be made against only “Adult Male Person”. Male may also be using a non-adult (juvenile) person of 16-17 years’ age to harass the woman. Because of this loophole, Bombay HC had to discharge women and a minor boy accused in a DV case. 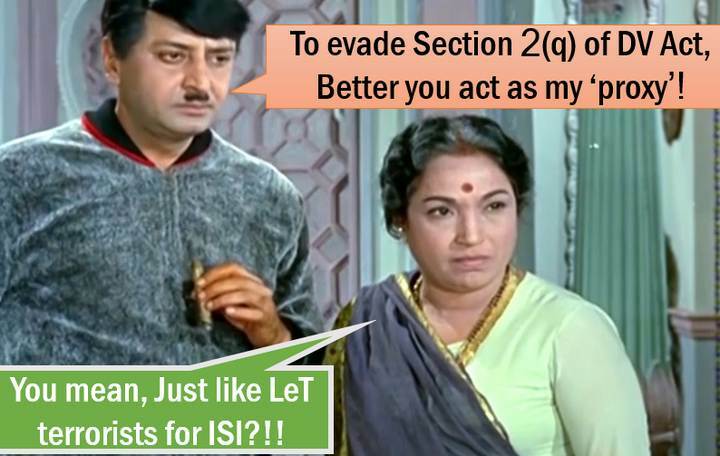 Therefore, SC has applied Doctrine of Severability to remove the word “adult-male” from the section 2(q) of DV Act. Henceforth, even women (and non-adults) can be booked under Domestic Violence act. Microscopic difference of adult vs non-adult; male vs female in Section 2(q) defeats the prime objective of Domestic Violence Act. SC Judgment has strengthened woman’s right to life, liberty, dignity by rectifying this section. Done in ~220 words. More analysis can also be written – e.g. if court passes a “residence order” under section-19 of the act wherein male is removed from shared household, still he could harass woman using proxy-terrorists. but then again we are preparing GS, and not law optional so no need for wasting precious time before mains on such hair-splitting on every topic of current affairs. Due to expensive textbooks and their shortage in libraries, Indian college students often resort to photocopying. In 2012: Oxford, Cambridge et al went to court to stop shops outside DU, from selling photocopies of the academic books as ‘course-packs’. Delhi HC held under Copyright act section 52/1/i: Teachers, students exempt from copyright infringement for educational purpose. Academic textbooks are expensive. Only universities can afford to purchase but too many students and libraries don’t have sufficient copies. If we want educated work force and informed citizenry, then such exception will be required. Lack of good schooling could have been averted with well-stocked library. But since that is not happening, so stopgap solution is right to photocopy to ensure educated workforce and citizenry. Done in ~150 words. No much point in hair splitting about publishers’ claim that photocopy walla were agents of the university etc. Because, we are preparing for General Studies not law optional subject. If all prescribed books are to be purchased, even ordinary BA course will cost lakhs of rupees. Ink fades away, semester system so student unlikely to re-read it in future unlike textbook. And they’re so expensive, only few copies purchased by libraries. Academic publishers pay petty amount of royalty to professors. Get free editing – proof-reading service from professors. Indian copyright Act is mainly designed for protection of ‘mass-market high value items’ such as movies and music. If it’s immoral to steal book from a store, then it’s immoral to photocopy it as well. Samuel Colt and Wright brothers’ patents hampered the R&D in handguns and aero planes in the initial years. (says NITI Ayog member Bibek debroy) so let the information flow freely. Internet / google / e-library can’t be substitutes to books, IF we want to race against 1st world. Academic poverty because students only reading selected chapters of photocopied ‘coursepacks’. Topic continues to evolve, because both pro and anti-arguments walli columns keep appearing every 2nd week. So you can add more points in your notes as you come across them. Dy.EC Sandeep Saxena committee formed to look into voting rights of prisoners. PIL in SC to prohibit convicted MP/MLAs to contest again. CM Jaylalitha’s conviction, acquittal in 2015 and UPSC’s affinity to ask one-year-old topics. Convicted felons serving jail term. Spain, Sweden, Switzerland and Finland give them voting rights. Many 1st world countries don’t give. It’s not right to put blanket ban on all prisoners. 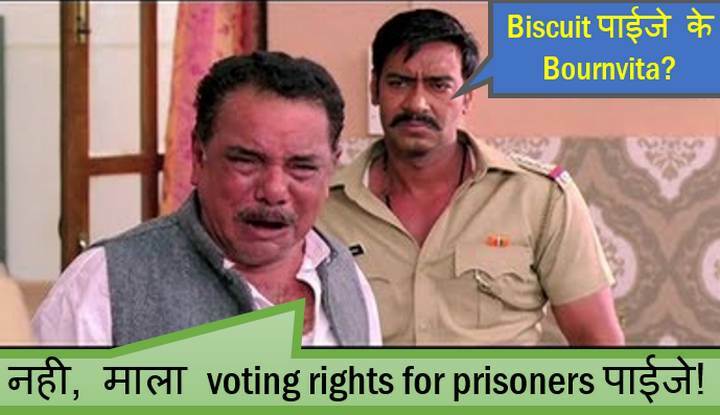 Many in jail for petty crimes so taking away their voting rights is one more layer of over-punishment. Studies indicate many in jail because they didnot get good lawyer because they’re poor due to their Backward caste / muslims origin. So taking away their voting right means difficult for their leaders to win election = further alienation from mainstream. Logistical challenges in organizing postal ballot, finding constituency, how is in jail for what offense, their socio-economic status etc. Fuller participation of “citizens” in democracy. Right to vote is not a constitutional right. It is a statutory right. Parliament empowered put restrictions on it. Ironic that convicts can contest elections (after 6 years ban) but cannot vote (while in jail). When he is released from jail, he’ll be able to vote again. And lastly, Dy.EC Sandeep Saxena committee formed to look into voting rights of prisoners. So wait and watch till then! 6 years ban: if person (including MP/MLA) jailed for more than 2 years. 6 years ban: If jailed for more than 6 months for hoarding and profiteering, adulteration of food or drugs, dowry prohibition, commission of Sati, etc. should be lifelong ban, atleast on MP/MLA from re-contesting. 2014: CM Jayalalitha convicted in disproportionate asset. So, automatically she stopped being MLA and CM. Done in ~370 words but if you delete the explanations and side notes then it can be winded up within 200 words. Visit Mrunal.org/Polity for more on polity related developments. For ever indebted to your help, thank-you so much. If even such macro articles were published from time to time it’ll help a lot. Watching video is nice but some study material to supplement it would be better. Just grateful Sire……you saved the day and you save the day, as always!!! Right direction keeps close to goal ,thanks for developing depth & close analysis on current event. You are the dark knight Batman for all aspirants. So helpful! Please do more of these. Thank you, thank you. Notes r lyk ..listening to most favoured teacher in classroom..:) Xtremely knowledgeable..
Sir, may i get any information regarding the notification APFC 2017 , whether it will b released or to be late? Please provide either a link here or mail me at [email protected] , i’ll reciprocate my notes/ source for Anthropolgy if you need. Please provide either a link here or mail me at [email protected] , i’ll reciprocate my notes/ source for Anthropology if you need.